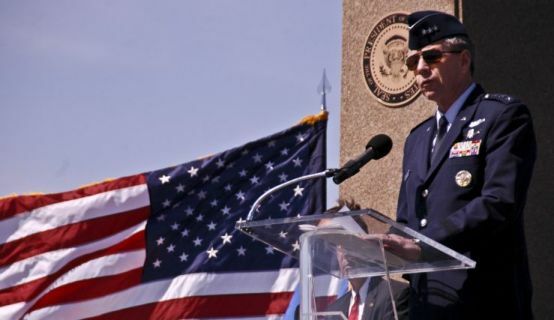 Lieutenant General Henry "Trey" Obering addresses service members and dignitaries at the dedication of the Ronald W. Reagan Observation Area aboard Vandenberg Air Force Base. 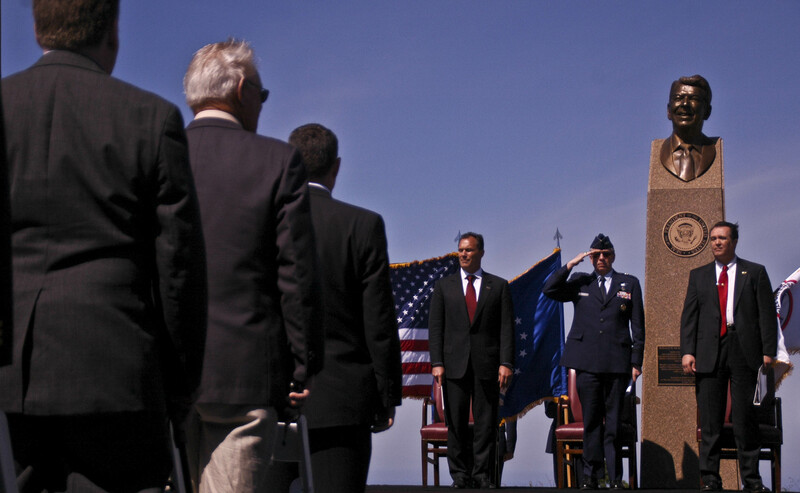 Yesterday at Vandenberg Air Force Base, amidst the pomp of a military band and saluting airmen and soldiers, Lieutenant General Henry “Trey” Obering-the director of the U.S. Missile Defense Agency-dedicated a missile launch observation platform in honor of former president Ronald Reagan. Reagan-considered by many to be the father of ballistic missile defense-who was instrumental in initiating the current worldwide integrated ballistic missile defense system, of which Vandenberg is part. 25 Years ago, the Cold War was on the wane, but still very alive in the minds of many Americans. It was then that President Reagan launched the Strategic Defense Initiative, which was designed to replace the Mutually Assured Destruction Doctrine in place at the time. His now famous “Star Wars” speech in March, 1983 was the impetus for the program, which called for ground and space based interception of ballistic missiles. The concept never took off on the scale that was originally intended, and a regionally based missile defense system was adopted until 2002, when the Bush Administration created the Missile Defense Agency. Incorporating 24 Ground-based Midcourse Defense ballistic missile interceptors (GMDs)-21 of which are located at Ft. Greely, Alaska and three of which are at Vandenberg-the Navy’s ship and submarine based Aegis Defense System, and mobile, unit based interceptors located throughout the world, the newest missile defense system is a joint service operation utilizing air and satellite based sensing systems. The Missile Defense Agency functions as a separate department within the Department of Defense. 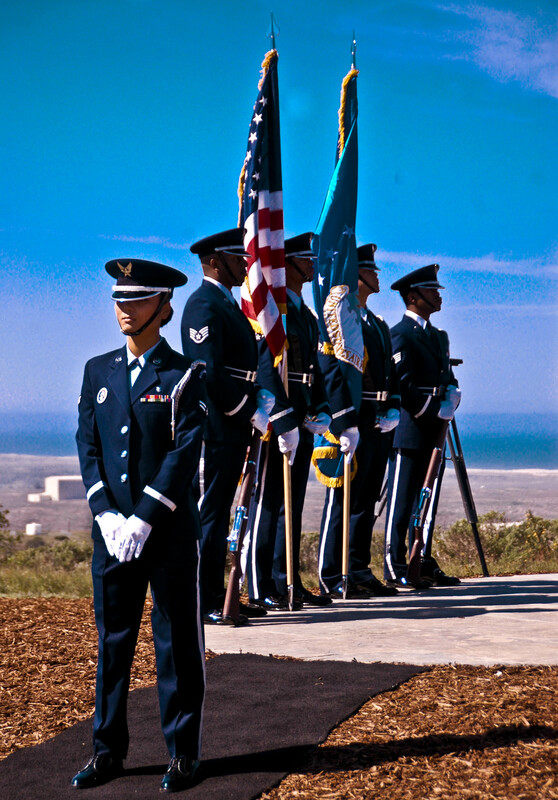 According to Vandenberg officials, the three interceptors located at Vandenberg-which have been operational since 2006-will be operated by active duty members of the National Guard’s 100th Missile Defense Brigade. General Obering stated that a fourth interceptor is planned for Vandenberg, and negotiations are underway with the governments of Poland and the Czech Republic to install up to ten interceptors in Central Europe. General Obering indicated said that testing of the GMDs has indicated that they are very effective. A bust of Reagan looks over Gen. Obering, Rep. Franks, and other dignitaries. Also attending the dedication was Representative Trent Franks (R-AZ). “I see this not only as a last line of defense against all threats,” said Franks, a member of the House Armed Services Committee, “but as a first line of defense against nuclear proliferation, because it renders impotent all [ballistic nuclear missiles].” Franks stated that $9 billion has been earmarked for the project out of the Defense Department’s budget. 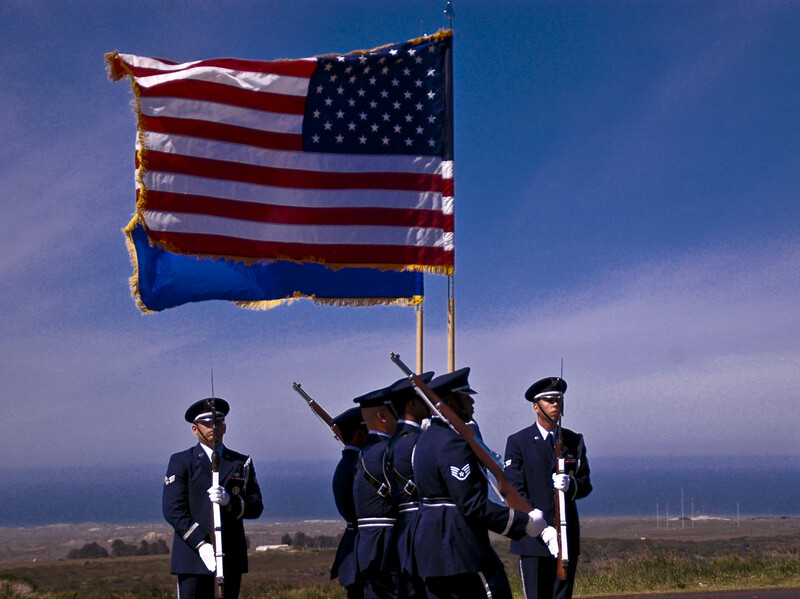 The Vandenberg Color Guard in revue. Obering, who is slated to retire this year after 35 years of service, praised what he called Reagan’s “vision,” and the shift enabled by strategic missile defense from a “massive retaliation” mentality towards nuclear arms to the “peace through strength” ideal championed by Reagan. “We will continue to expand interceptors and testing:here at Vandenberg,” he said.